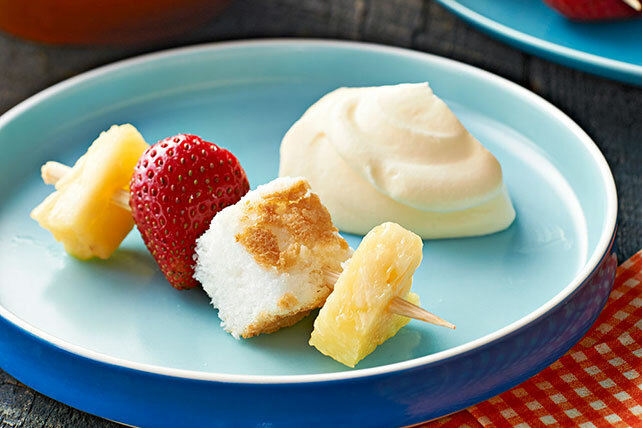 Enjoy a deconstructed angel food cake with this Angel Lush on a Stick. Angel Lush on a Stick is, finally, a cake you can politely eat with your hands. Beat pudding mix and milk in medium bowl with whisk 2 min. ; stir in COOL WHIP. Refrigerate until ready to serve. Cut cake into 18 cubes; thread onto 18 skewers alternately with fruit. Insert skewers through sides of strawberries to prevent them from sliding off the skewers. For best results, use thin 4-inch-long bamboo skewers. Use a serrated knife and gentle sawing motion to easily cut the angel food cake.